If you have any questions or want to enquire about dates, use our form to contact Marie Forster or see their website for more information. Nature lovers will be in their element. This is rugged countryside in the heart of the Snowdonia National Park, with mighty mountains swooping down to sandy beaches. You can hike, bike, picnic, fly through trees on a zip wire, take a trip on a steam train, even bounce around on enormous trampolines in an underground cave. Stagger back to your warm and comfortably restored 1800s former stables, up a track laden with rhododendrons and azaleas. Walk straight into the kitchen to find slate tiles, wooden units with granite-style tops, a door to the garden and everything spick and span. Choose to eat here or upstairs in the cosy living room by the electric wood-burner. Plenty of squashy leather seating and soft oatmeal carpets will encourage a spot of sprawling but you’ve probably earned it. Bedrooms are up here too: a sweet L-shaped single with a brass bed and a good-sized double with a door to your own patch of garden; sit up and drink your tea in the summer and let birdsong beguile you. Mattresses are thick, cotton is crisp, duvets are feather and down, the peace is profound. Marie meets and greets and lives nearby. Special offer: Award-Winning Cottage - Rated 'EXCELLENT' on Trip Advisor. Fancy Zip Lining? ... just 8 mins drive! 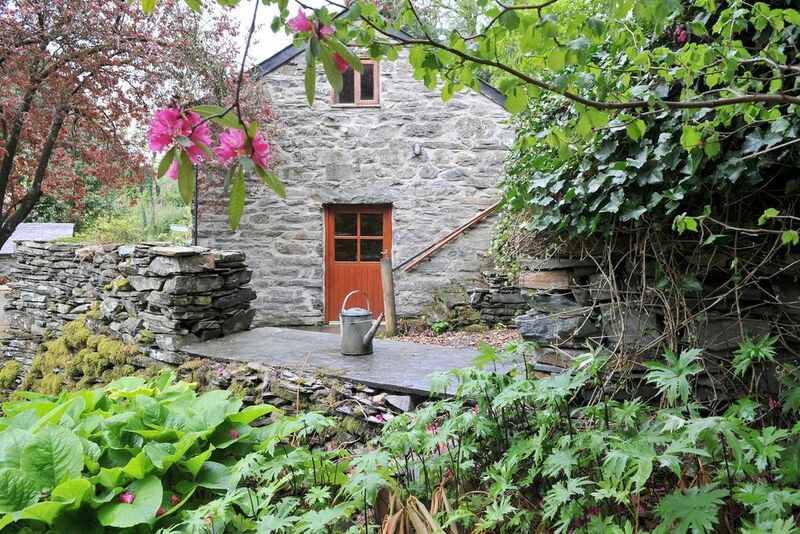 BOOK Online at www.snowdoniacountrycottages.co.uk. Free bottle of wine with every booking. Minimum stay: 3 nights. 4 nights on weekdays. 3 nights at weekends. 7 nights in high season. Short breaks available. Ideal setting for a peaceful getaway. The Coach House is so comfortable and cosy with every amenity taken care of and spotlessly clean. The directions to the property was clear and easy to follow and is set in stunning countryside. We met Marie who was very welcoming and suggested various places to visit but let you to it if that is what you wanted. We spent our days discovering the area (although we knew Conwy pretty well) and the gorgeous weather helped. There's plenty to see and do in the area and fell in love with the Welsh countryside. We'd highly recommend the Coach House. Abso-loute-ly LOVED it! After looking at several places that were advertised, me and my wife decided to book the Coachhouse and we are glad that we did - we absolutely loved it. The cottage was in a lovely rural setting; away from all the hustle and bustle from city AND village life - yes, it is that rural, but at the same time we didn't feel like we were totally cut-off from the outside world. We would like to say a Very Warm Thank You to Ray and Marie for all their hospitality and kindness; we really enjoyed ourselves and look forward to returning. Having thoroughly enjoyed a week at the Coach House in August 2017 we rebooked for this year. The Coach House was just as idilic as we remembered and Marie and Ray offered a warm and friendly welcome. Another perfect holiday and a real home from home for us. We hope to return again. We arrived late evening with our toddler to this lovely cottage. The key safe was useful so we didn't need to bother the owners. We were impressed with how cosy and well equipped the cottage was. We didn't have the best weather over the weekend but we made the most of the surrounding area, it was a great base to explore. The owners were very helpful and easy to communicate with. WiFi worked very well. Children's books and toys were made available, as well as a highchair, change mat and travel cot. Easy to see why this place has won awards. We would recommend it to family and friends. Well on our final evening at The Coach House we have concluded this to be one of our holidays of all time. It's one of the best for many reasons including this lovely homely retreat which is as wonderful as the pictures suggest. We have all thoroughly enjoyed every minute. Hope to come back again to see more one day. Gorgeous cottage! We had such a good time it was so well equipped, cosy and very quaint! It is rural but still only 10 mins from the local town Porthmadog and just a 10 mins walk to The Grapes the local pub. So much to do and see. ....it was impossible in just a weekend. The owners were fab and so helpful. Can't recommend this cottage enough! Don't look just book! Love this cute little cottage. So pretty and set in beautiful grounds. Only 10 mind from the pub and so easy to get to all the attractions. Owners were great and sofriendly and helpful. Will definitely be back! We enjoyed a very relaxing 4 night break at the Coach House. The cottage was everything as described and proved to be comfortable, cosy, spotlessly clean and in a beautiful location. Booking arrangements were straightforward, we were made to feel very welcome and our security deposit was returned within a few days. Wouldn't hesitate to recommend and we hope to return. The famous FFESTINIOG STEAM RAILWAY' is a great day out for all the family - see the most spectacular views on your journey! Want to see a bit of the outdoors then 'COED Y BRENIN' & 'ANTUR STINIOG' Mountain bike centres are 10 mins away! 'PORTMEIRION' Italianate village with it's coastal walks and famous hotel, restaurants and shops is close by and the famous 'FESTIVAL NO6' is held here. For the adventurous you can also 'KAYAK' around Portmeirion or along the the river Dwyrydd. 'BOUNCE BELOW' just minutes away is the world’s first subterranean playground of its kind. Set within a historic disused slate cavern the size of St Paul's Cathedral. Huge trampoline like nets are hung within two vast chambers at varying levels! 'HIT THE BEACH'! Stunning Harlech beach and its surrounding dune area is one of the finest examples of a natural dune system in Britain. Just 15 minutes drive for sun, sand, relaxation and great walks. Or drive along 3 miles of beach at Black Rock Sands!